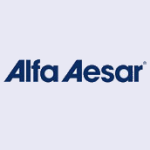 Part of the Johnson Matthey group of companies, Alfa Aesar is a leading manufacturer and supplier of research chemicals, metals and materials in a wide span of applications. For more than 45 years, scientists have relied on Alfa Aesar to supply high purity raw materials for a variety of research and development applications. Today we offer over 30,000 products in stock, in sizes from gram-scale catalog items to semi-bulk and bulk production quantities. With custom manufacturing capabilities to supply many more specialized items, we are a one-stop source for research chemicals, metals and materials. Our product line consists of a comprehensive range of inorganic, organic and organometallic compounds; pure metals and elements; precious metal compounds and catalysts; fuel cell products; nanomaterials; rare earths; analytical products; and select laboratory equipment. Backed by the global manufacturing network of Johnson Matthey and other key partnerships, we offer customers the highest quality and purity in fine chemical products. We are accustomed to supplying R&D laboratories in the pharmaceutical industry and the electronics industry, as well as academic institutions and many others.